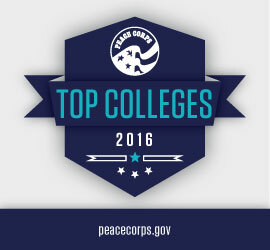 WASHINGTON, D.C., Feb. 18, 2016 – Washington state once again makes a strong showing on the Peace Corps’ list of top volunteer-producing colleges and universities with three Evergreen State schools holding the top spot in their enrollment category. The University of Washington ranks No. 1 among large volunteer-producing colleges and universities and also appears on the agency’s list of top volunteer-producing graduate schools. Gonzaga University and the University of Puget Sound share the title of No. 1 among small schools, rounding out three of the seven total Washington state schools on the 2016 list. The George Washington University in Washington, D.C., claims the top spot among medium-sized colleges and universities, followed closely by local rival American University. Georgetown University and Howard University—which remains the first and only historically black university to appear on the list—join George Washington and American as D.C.-based schools to rank in the medium-sized enrollment category, taking the No. 7 and No. 14 spots, respectively. Among graduate schools, Tulane University holds the No. 1 spot for the second consecutive year. The University of California, Berkeley remains the all-time highest producer of Peace Corps volunteers in the country, with more than 3,600 alumni to have served since the Peace Corps was founded in 1961. Simmons College—one of the few women’s colleges on the list—made the largest leap in rank this year, moving from unranked to No. 8 among small colleges and universities. Emory University moved from No. 24 to No. 8 on the list of medium-sized schools and Indiana University Bloomington jumped to No. 7 from No. 20 in the large enrollment category. Below are the top five colleges and universities in each category and the number of alumni who are currently serving as Peace Corps volunteers. View the complete 2016 rankings of the top schools in each category here. * Rankings are calculated based on fiscal year 2015 data as of September 30, 2015, as self-reported by Peace Corps volunteers. In advance of the top schools announcement, the Peace Corps gave an exclusive preview of the top-ranked schools on the agency’s new Snapchat account and premiered an interactive map that enables users to see where alumni from a given university are serving. In 2015, the agency saw a 40-year high in application numbers, reinforcing the Peace Corps’ role as a dynamic, forward-leaning champion for international service more than half a century after its creation. About the Peace Corps: The Peace Corps sends the best and brightest Americans abroad on behalf of the United States to address the most pressing needs of people around the world. Volunteers work with their community members at the grassroots level to develop sustainable solutions to challenges in education, health, economic development, agriculture, environment and youth development. Through their service, volunteers gain a unique cultural understanding and a life-long commitment to service that positions them to succeed in today’s global economy. Since President John F. Kennedy established the Peace Corps in 1961, more than 220,000 Americans of all ages have served in 141 countries worldwide. For more information, visit www.peacecorps.gov and follow us on Facebook and Twitter.